SlotsOdds.net > How to play slots: Pull the Button and Enjoy the Game! Get to know how to play slots! It is known that slots games are the most famous and the most played games at each casino: people who come to the casino to try themselves in some more difficult game will not spare some coins to play the slots machines game. It's a simple game that will never bore the gamblers, who know or even don't know how to play slots. So, you are at the casino and consider yourself to be the real dummy that doesn't know how to play slots. First of all choose the best machine for you: the most colorful or vice versa not so flashy one; think a little bit about the symbols that you'd like to encounter on the reels, it can be your favorite singer or actor, or just some "theme" symbol of fruits. It's up to your choice, but also slots games variety and slot machine work depends on the casino which you visit. So, you have cleared up the kind of the symbols of the slot machine that you want to try. What do you have to do next when you have already examined how to play slots at the beginning? Find in your pockets some amount of coins and launch the game, inserting them into the "slot". The play button can be named on the machine as the "spin", "bet" or "bet max". It depends on the slots types you're playing. So, pull it! In advance, you must be aware that if you win something and can't receive your payout, just call for the assistant that will help you, don't shake the machine or something like this. 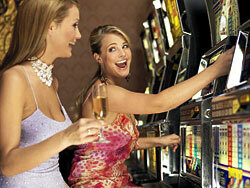 Another very important step is to read the slots instruction that you'll find in each pay table of the slots. In such a way you'll find out what to expect from the winning combinations and what you're going to receive if you manage to win. Not every time you'll be awarded with cash, sometimes the player can be presented with the free spins or bonus games that will provide the additional opportunity to get more chances to be a winner. One of the things that players have to always remember is that there is no luck - Random Number Generator owns everything. Every spin is decided long before, because this generator doesn't stop even if you don't play, it continues spinning the figures that correspond to some of the symbols and their combinations. Another fact that will disappoint a little bit gamblers is the fact that house edge is higher every time, and one has little chances to become a winner of a huge prize. But he\she would enjoy even the mere act of playing because it's really exciting! And even if you're not an expert but know how to play slots in a right way, it'll be enough!